Also known as as Le jardin des plantes et le jardin botanique de Caen, the garden dates back to 17th century and the earliest of its plants were collected in 1689. Set up on the site of an old stone quarry as a botanical garden of the university, post French revolution, it was expanded by 3.5 hectares to become a municipal park. Couple of green-houses were installed which were destroyed in World War II. New green-houses were constructed post the war. The garden exhibits more than 8000 different species of native plants, medicinal plants, horticulture collections, rockeries, arboretum, and shrubs. 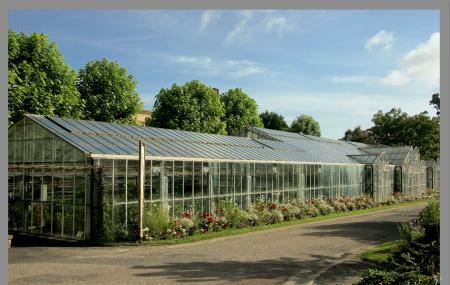 The green-houses also have a collection of around 1500 exotic species. Now a public park, it also serves as an ideal picnic area. A parking space at the park entrance. Public toilets accessible to disabled. Guided tours for groups and the public with disabilities upon request. pic-nic area, toilets, toilets, drinking fountain, children's playground, sandpit, table tennis tables, loan wheelchairs, educational activities, dogs allowed on a lead. The greenhouses are open from 13:00 to 17:00. How popular is Jardin Botanique De Caen? People normally club together Memorial Of Caen and La Colline Aux Oiseaux while planning their visit to Jardin Botanique De Caen.